Don't contain Lead,cadmium,antimony,could pass SGS,LFGB,FDA certificate Storage food or cook food Suitable to gas or induction cooker and refrigerator. Keep the surface dry and clean. don't use in the microwave-oven. don't drop . 1. Before first use: Rinse (without soap) the cookware in hot water, then dry completely. 2. Apply a light coat of vegetable oil onto the inside surface before cooking. 3. DO NOT place cold cast iron cookware on a hot burner. 1. Let the cookware cool. Placing hot cookware in cold water will damage the iron and may cause craking or warping. Wash with a brush and hot water. DO NOT USE soap or detergents. DO NOT wash cast iron in a dishwater. 2. After cleaning immediately dry with a towel while still warm, reapply another light coat of oil to prevent corrosion. 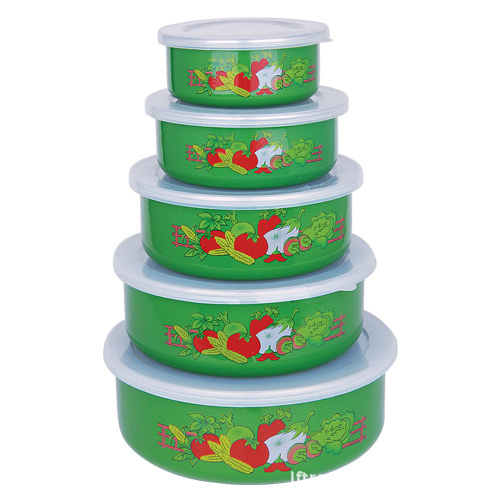 Contact us if you need more details on Metal Enamel Bowl. We are ready to answer your questions on packaging, logistics, certification or any other aspects about Ice Cream Bowl、Metal Enamel Bowl. If these products fail to match your need, please contact us and we would like to provide relevant information.